HOUSTON (KTRK) -- Today at Must Be Heaven Cafe in downtown Brenham, a sign on the ice cream counter announced that Blue Bell was off the menu. "Good things happen to those who wait," it read. No one knows how long that wait may be. The Blue Bell recall has affected 23 states, and taken million gallons of its ice cream off the market, after listeria bacteria was found in a piece of equipment at the company's Brenham Plant. Its Oklahoma facility was taken off line last month after it too tested positive for the bacteria. At Must Be Heaven, owner Charlie Pyle says he will not accept a substitute for Blue Bell. "I'm not gonna put in Dippin Dots -- no." For emphasis, he said, "no again." In Brenham, customers are loyal. One 19-year-old customer said, "Everybody can make a mistake. They'll fix it and everybody will be eating Blue Bell again." Most people in town fall into three categories: have a friend who works for Blue Bell, a family member who works there, or they work for Blue Bell themselves. Connie Glaesman's sister has worked at the company for more than 20 years. "They (The owners) are like family. They know us, we know them. They treat their workers well," she says. The company has not laid off anyone, according to Blue Bell's spokesman. Joe Robertson said today, "We need everyone at work. We have salespeople dealing with retailers, drivers on the job, and ice cream being produced. We need all our employees here." Some of the employees are now staffing the call center, answering consumer questions about the recall. For now, plant tours and tastings have been suspended- a sign on the door says "for the remainder of the week. Robertson says, "Each day we get closer to identifying the cause of the bacteria here and how it got here." He did not elaborate on where the evidence may be leading investigators. In the meantime, production is continuing at the Brenham Creamery. 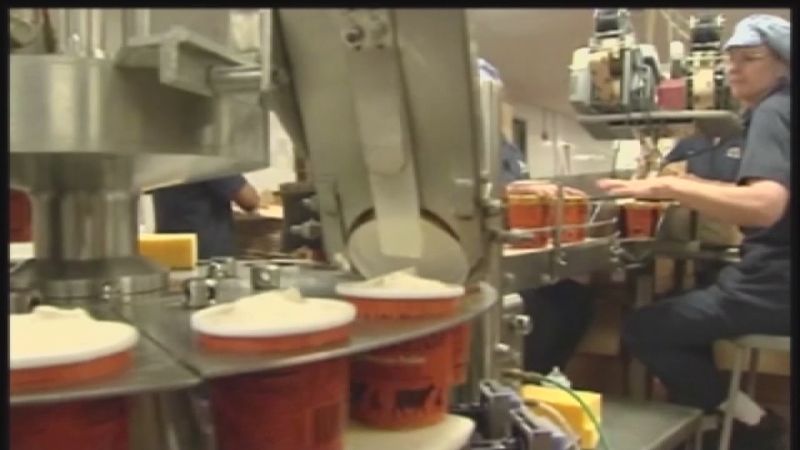 What's produced is being tested for the presence of listeria. Robertson is already looking ahead to when sales will resume. Consumers though may have to make due with fewer flavors at the start. He says their top flavors will be first to go back into production, Homemade Vanilla, Dutch Chocolate, Neopolitan, Cookies and Cream, and Butter Pecan. "We have to ramp up slowly," he says"
From the empty shelves inside a Sellers Brothers grocery store in West Houston, to the empty spot in Bianca Hopkins heart, no Blue Bell is, or a lot of people, sad. "I hate to get any other kind of brand of ice cream," said Hopkins, whose one-year-old Brielle loves the treat too. "I've always known to eat Blue Bell ice cream. I don't know anything else." Blue Bell pulled all of it products Monday night because of listeria, bacteria that many of us carry in our gut, but which is especially dangerous to the elderly, the immune compromised and pregnant women. "Pregnant woman are 13 times more likely to get infected bacteria and have symptoms related to that meaning for themselves as well as for their children," said Dr. Corrie Chumpitazi with Texas Children's Hospital in Houston. She has treated the disease in women and in newborn children. She says there is no known reason pregnant women are more susceptible. Dr. Peter Hotez Is an infectious disease specialist who runs the national school of Tropical Medicine. He says certain foods are especially at risk, like soft cheeses, ice cream and more. "The contamination can occur after pasteurization," he explained. "The other interesting feature about listeria bacteria is they can uniquely replicate at cold temperatures. Particularly processed meats such as hot dogs, such as processed deli meats-turkey, cold cuts, they can have very high levels of listeria bacteria." Tuesday the Centers for Disease Control issued a new alert related to Blue Bell, reporting 10 people in four states have contracted the disease. Three of them were in Texas. There is also a new, suspected case, though the government won't say where it is. The Texas Department of State Health Services will not specify in which cities or counties the three Texas cases occurred.